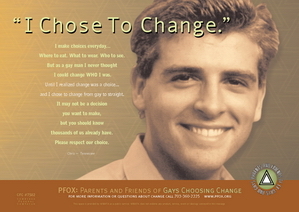 Parents and Friends of “Ex-Gays” (PFOX) has always been somewhat of a oddity. It was founded by the eccentric Anthony Falzarano (Roy Cohn’s former houseboy), who fronted the group for the Family Research Council – which funneled PFOX tens of thousands of dollars. After Falzarano ratted out the right, saying they did not truly support “ex-gay” ministries (just ad campaigns to pass anti-gay laws) the right wing drove him out of Washington. The organization was then taken over by Regina Griggs, a mother who was embittered because she had an openly gay son. To help her with the operation, Griggs enlisted discredited therapist Richard Cohen, who was booted from the American Counseling Association. Like Falzarano, he was also chased away by the Religious Right in 2007, after a series of humiliating television performances. The truth is,the APA has no official position on the causes of homosexuality. The APA, however, has made many policy decisions which would support the view that the scientific studies of homosexuality do, in fact, support that there is some biological component to homosexuality.